Only three railroads have submitted safety plans to government, a necessary step before they can put the technology — positive train control, or PTC — into operation, the Federal Railroad Administration report said. They are BNSF Railway (for the record, BNSF is a corporate sponsor of PBS NewsHour), the nation’s second largest freight railroad, and two commuter railroads — Metrolink in the Los Angeles area, and the Southeastern Pennsylvania Transportation Authority in the Philadelphia area. Amtrak hasn’t submitted a plan yet, but railroad officials have said they expect to meet the Dec. 31 deadline. Some railroads are lagging far behind. Union Pacific, the nation’s largest freight railroad, hasn’t equipped any of its 6,532 locomotives with the technology, according to the report. None of Norfolk Southern’s 3,400 locomotives are equipped, either. 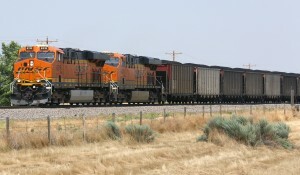 The type of PTC being put into place by most railroads relies on GPS, wireless radio and computers to monitor train position and automatically stop or slow trains that are in danger of derailing because they’re traveling too fast, are about to collide with another train or are about to enter an area where crews are working on tracks. Support for a lengthy extension diminished after accident investigators said the May 12 Amtrak crash, which killed eight people and injured about 200 others, could have been prevented if PTC had been in operation. A sweeping transportation bill passed by the Senate last month contains provisions sponsored by Thune that would give railroads another three years to install the technology, but leaves open when they must have their PTC systems certified by the government, a necessary step before the systems can be put into operation.